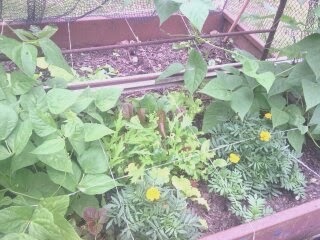 The trailer bed I planted using the square foot gardening method is growing really well. I am pleased with the results, mostly. Some of the squares are not growing as well as I would like for a variety of reasons, but the bed looks great and I will be starting to pick greens for salads very soon. 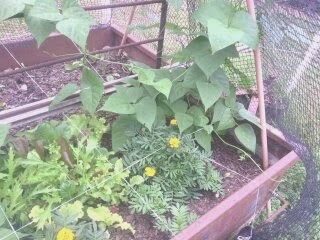 The climbing and bush beans are thriving (as you can see), they are heading up the trellis and some are even growing out the top of the net. 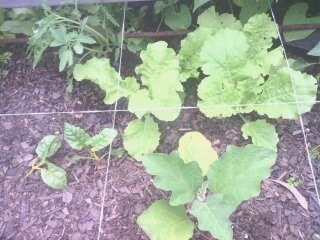 The baby salad greens are ready to harvest too; don’t they look yummy. 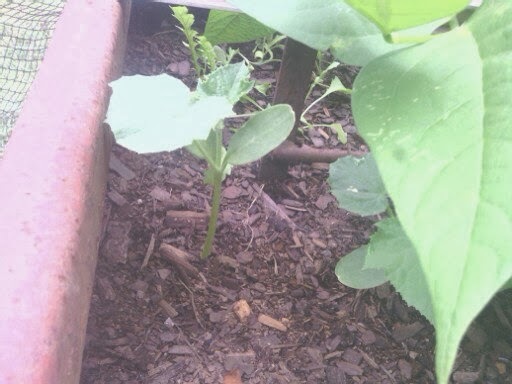 The little cucumbers are finally up and starting to grow. 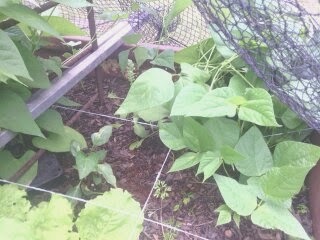 The beans are providing competition for light though; I will have to remember to plant the climbers further apart next time. The Ceylon spinach is thriving and is ready to use but the mizuna, onions and carrots have not taken off as I would have liked. The germination rate for the carrots and onion was low too. The eggplant is up and growing well and the Tokyo bekana is ready to eat but the silver beet is struggling and I am down to two in the square. The capsicum is a seedling as none of the seeds I planted germinated, but it is growing really well. So far I am impressed with the method, even though I will have to fine tune the planting a bit next time. Plant climbers with at least one square between them to minimize crowding. Plant advanced seedlings of most vegetables (not carrots or beans). Plant extra carrot seed, at least three per hole, to allow for poor germination. Plant fast growers like beans two weeks after other seeds to reduce over shading of seedlings. 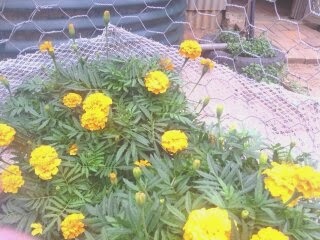 My marigolds are looking beautiful at the moment. 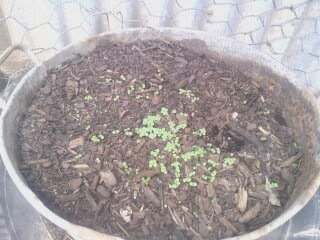 I have a big pot of Lemon Balm (Melissa) coming up right beside the door. Good idea Hawthorne. I have a little black bug eating the salad greens at the moment. 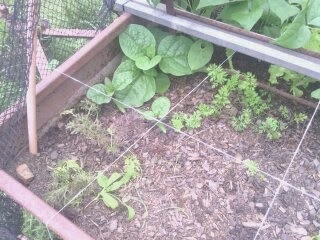 I'm doing an internet search on it; I need to replant the beds with Autumn plants soon.